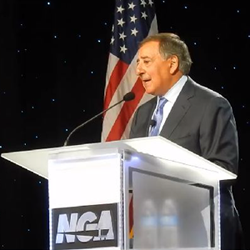 “THERE IS PROBABLY NO ISSUE more important today than cyber security,” said Peter Larkin, President and CEO of the National Grocers Association, in his remarks at the opening session of the annual NGA Show in Las Vegas, this week. True to his word, the event’s educational program included three breakout sessions and one general session devoted to various facets of cyber security – from safeguarding POS and mobile payments; to protecting proprietary customer data; to defending the enterprise against malicious attacks; to whether insurance can offer useful protection. Keynote speaker Leon Panetta, the former Secretary of Defense and Director of the CIA, said in response to an audience question that he could foresee the possibility of a “cyber Pearl Harbor” assault on American institutions and infrastructure. The siege is already well under way: The CIA was turning back some 100,000 cyber-attacks per day during his tenure from 2009-2011, he said. The pace has certainly accelerated since that time. I’VE BEEN ON RECORD many times as a hater of shopper loyalty, but an advocate of intelligent personalization. I admit my position can be construed as mincing words, but I remain stubbornly committed to the distinction. When marketers and retailers try to ascribe loyalty to their card-carrying customers they are usually delusional. When they demonstrate their commitment to those customers through good acts – by providing relevant values and experiences – they embark on a golden path. Supermarket chains so regularly miss this distinction with their frequent shopper card programs that it is a small revelation to encounter one who seems to have it right. In a presentation at the National Retail Federation Convention and Expo this week in New York, Loblaw Companies, Ltd., the leading grocery operator in Canada, shared some insights about its PC Plus shopper program, launched last May, that suggest it belongs in that exclusive tier. That’s an insightful way of looking at the return from a frequent shopper program that truly distinguishes highest-value relationships and cultivates them accordingly. Best shoppers deserve our best efforts because they are our best prospects too. PC Plus uses analytics to deliver relevant, highly personalized offers. With thousands of offers available across the store, the mix is tailored down to the individual level, based on each shopper’s history. “How big is the prize from personalization?” said Graeme McVie of LoyaltyOne, the company which helps Loblaw implement and operate PC Plus. “Even with best customers, opportunities exist to grow share of spend.” He shared an analysis of the 50 store categories across the top 20% of customers, which indicated a 50-70% share of spending, a finding which underscores the present value of best shoppers, but also their upside potential. 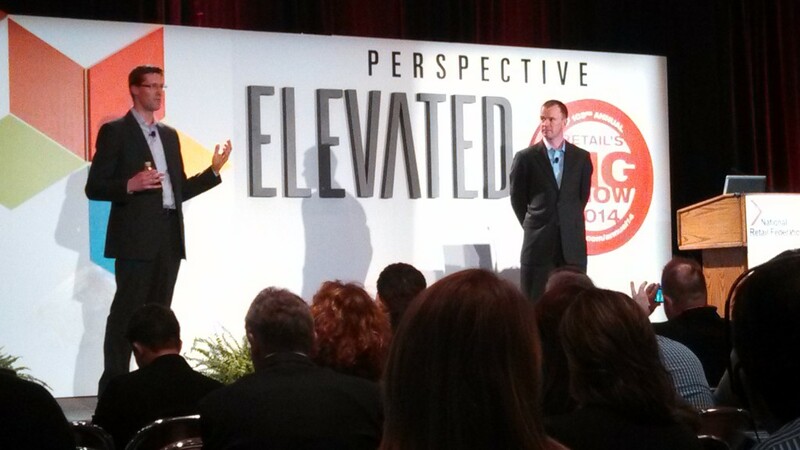 PC Plus is increasingly focused on the smartphone app as the “control center” for the shopper, Lewis said. It allows them to manage shopping lists from their phones, informs them of available offers, and allows them to accept offers in real time, even while waiting in the checkout lane moments before a transaction. McVie added that the design of PC Plus is oriented toward “democratizing shopper insights.” Its strategy is two-fold: understand the needs of individual customers and consistently execute actions to satisfy them. I’ve stated previously in this blog that we are entering a “post-loyalty” era, but intelligent personalization is far from dead. In fact it may just be hitting its stride at Loblaw. But my Field of Dreams reverie dissolved when I stepped up to the produce department. My first view was an abundant display of bananas – the largest selling produce item in most supermarkets. The UPC bar code is of format known as RSS_14 designed to convey more information than old-style 9-digit codes. 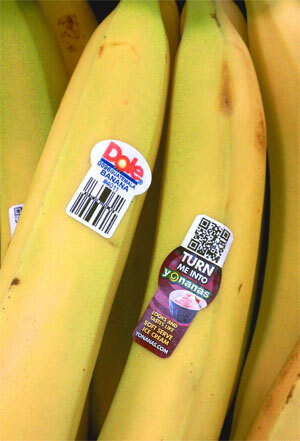 When I scan it with a gadget on my smart phone it correctly identifies the product as Dole bananas. Presumably the POS scanners in this HyVee supermarket are just as smart. The advantage: it saves the checker a few keystrokes and accurately enters the PLU (price look up) code for this variety of produce which is sold by weight. The QR code on the right is used to direct shoppers to a web site called yonanas.com . When I scanned it with the same smart phone app, it led me to a page pitching a simple kitchen appliance that lets consumers make a soft-serve dessert from frozen ripe bananas and other fruit. The Dole brand is featured prominently on the target Web page. Presumably there’s a deal behind it all. The Yonana appliance is marketed by Healthy Foods LLC, itself a division of Winston Products LLC in Cleveland, Ohio.